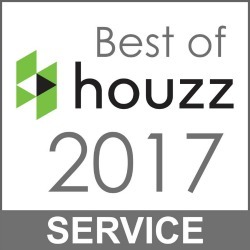 I have worked on numerous design projects throughout my career…from full kitchen renovations and master bedroom makeovers to entire first floors and complete basement remodels. But for the past few months, my three kids were constantly walking into my office with the same question over and over again…”Are you working on my room yet?” With a busy family life and a growing design business, my answer was always the same…soon! Hello 2015! It’s a new year and although I am not one to make New Year’s resolutions, I have to admit I love a fresh start. While many of us are kick starting the year with goals and aspirations, now is the perfect time to think about refreshing your home. Spending time in a room that feels new can provide motivation and boost energy levels that are much needed after the holidays. Of course there is no need for a major overhaul but simple changes can instantly transform the look of your home. Try these ideas and get ready to give your home a fresh start. Paint your room in a fresh new color. 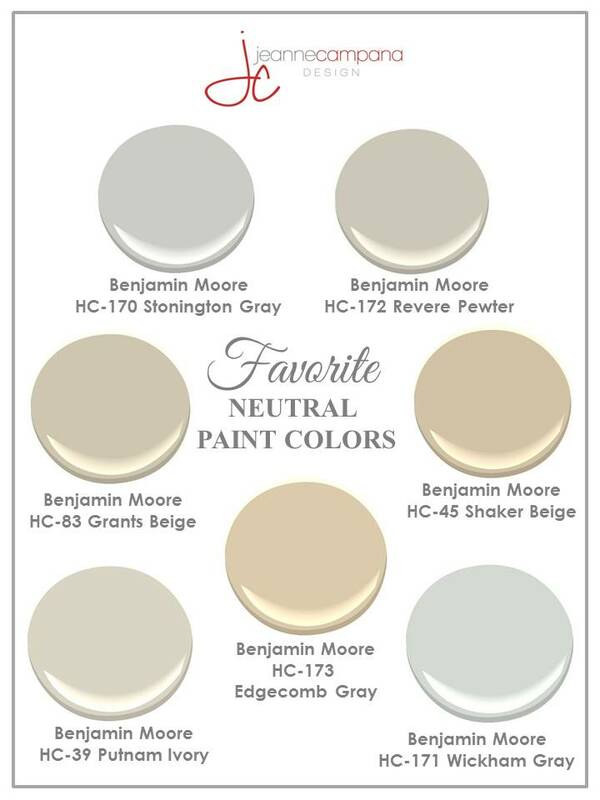 These are some of my favorite go-to paint colors. 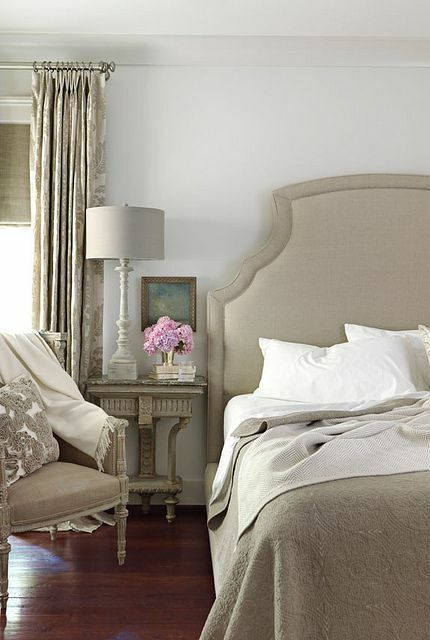 Adding a neutral color to your walls will create a clean backdrop ready for accessorizing. Pillows can add an instant pop of color to your room. Accessories are an instant refresher. 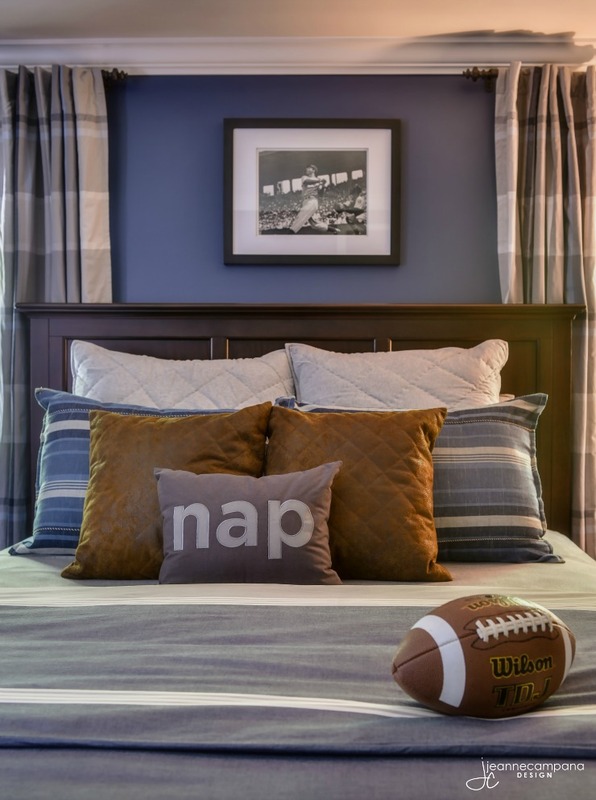 Create warmth by adding textural elements like faux fur pillows or a cozy cable knit throw. Metallic accents throughout the room will add a touch of sparkle that will brighten up any space. Gather your collectibles and display them on a shelf. Floral arrangements will also add a natural element to your room. Whether it’s an abstract piece, fine art or photography, your artwork will show off your style and personality. 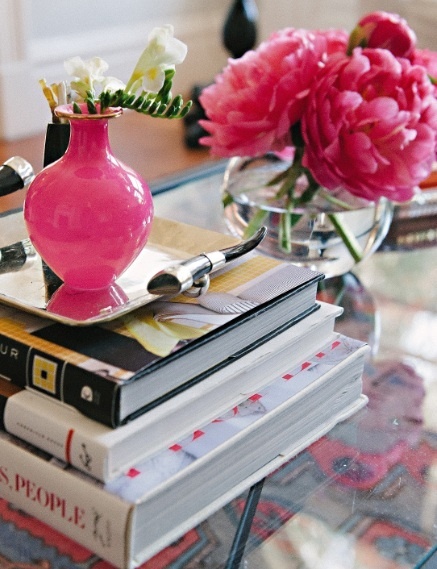 Available in a variety of colors, fresh cut blooms can dress up your space without breaking the bank. January is all about fresh starts. 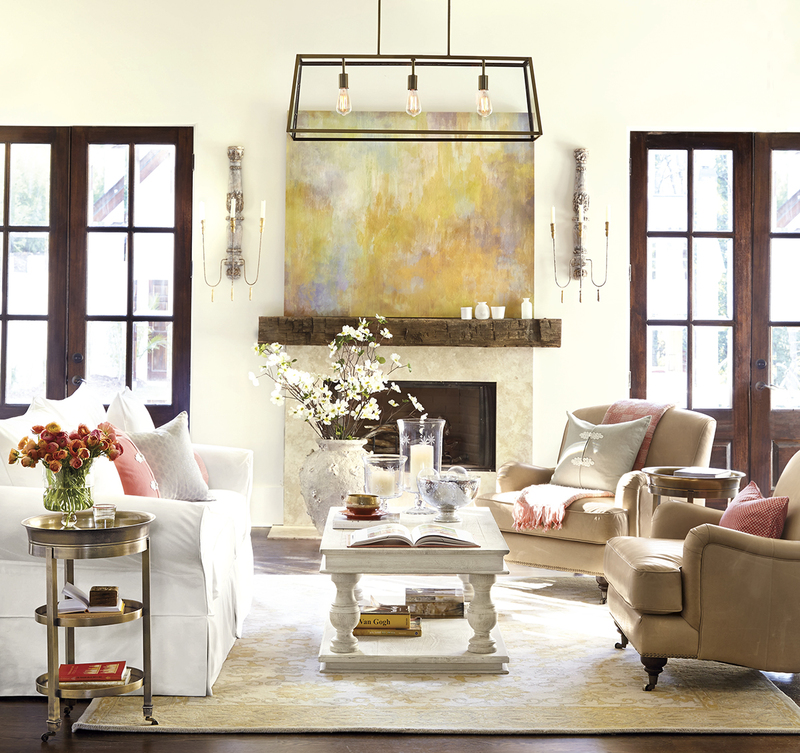 Reimagine your living spaces and gear up for a new year with a new look for your home. Happy New Year’s Eve! If you haven’t made plans yet, it’s not too late to put together a last minute get together to ring in the New Year in style. Here are some easy ideas to get the party started. Remember to keep it simple and fun. After all, what matters the most is the company that you will be sharing the evening with. Simple balloons create instant drama. 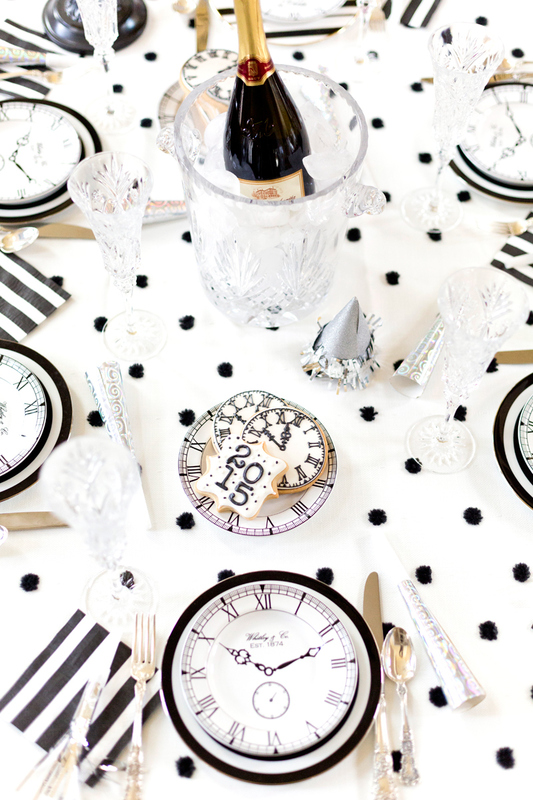 Jazz up your party with this clock inspired table setting. Click here for a free clock design printable. 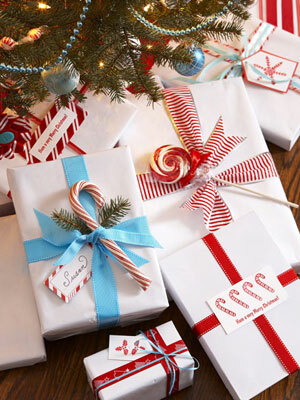 Then print, cut and place under a clear glass plate for a festive holiday look. Don’t spend all day in the kitchen. Ask your guests to bring finger foods and hors d’oeuvres. 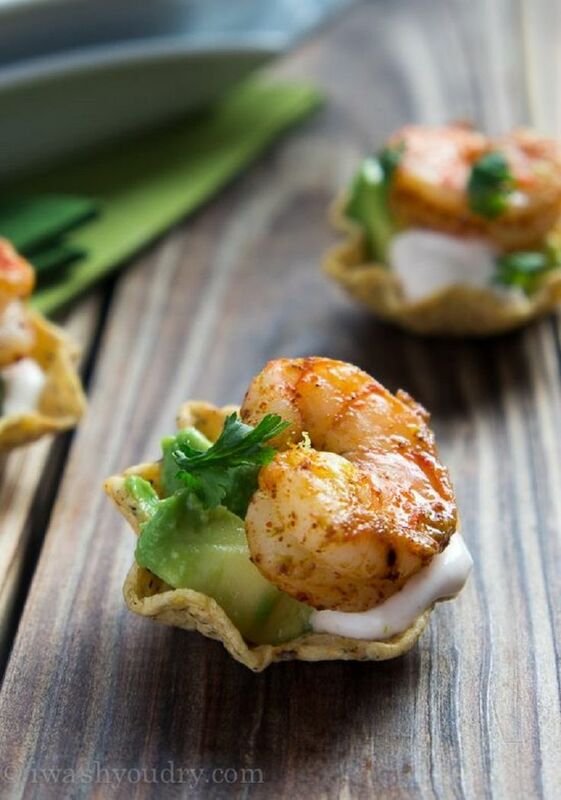 Want to know how to make these delicious Shrimp Taco Bites? Click on the photo for this delicious recipe. You’ll also find additional tasty, party ready appetizers to complete your New Year’s menu. 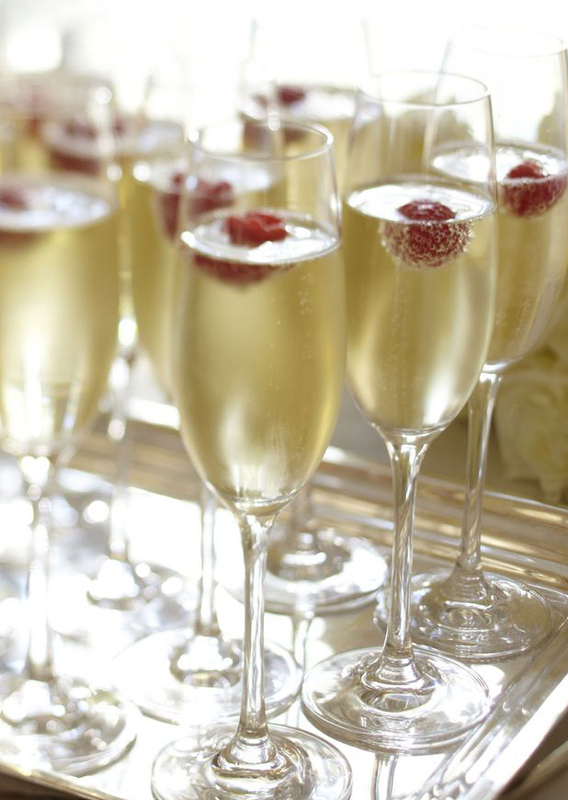 You can’t celebrate New Year’s without champagne. Along with the traditional bottle of bubbly, why not create a signature drink with this simple champagne cocktail. Combine 4 oz. Stellina di Notte Prosecco and .5 oz. cherry brandy in a chilled champagne flute. Garnish with a cherry. 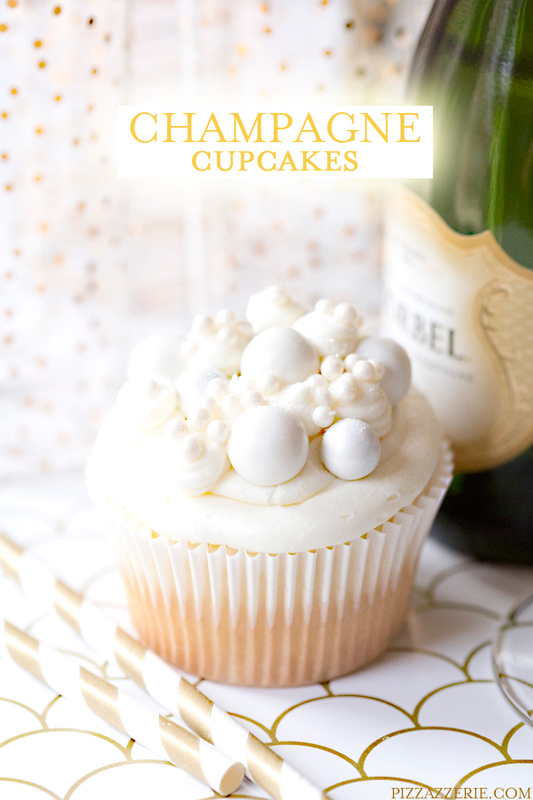 These gorgeous champagne cupcakes are the perfect New Year’s dessert. Happy New Year! Let the festivities begin! Wishing you and your family a wonderful 2015! You’ve made your list and checked it twice. 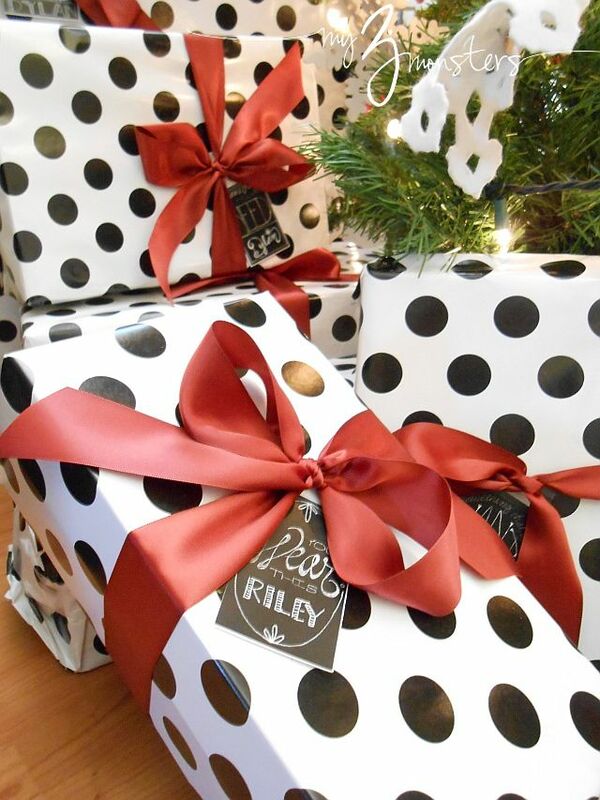 Christmas is right around the corner and it’s time to get those presents under the tree! 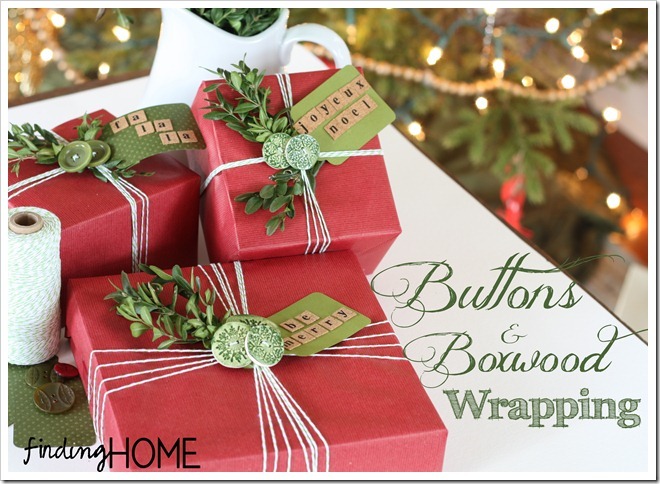 Gather your gifts, warm up a cup of hot cocoa, turn on some holiday tunes and get wrapping. 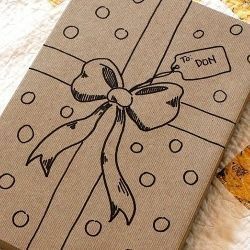 Here are some unique ideas for wrapping your gifts this year. 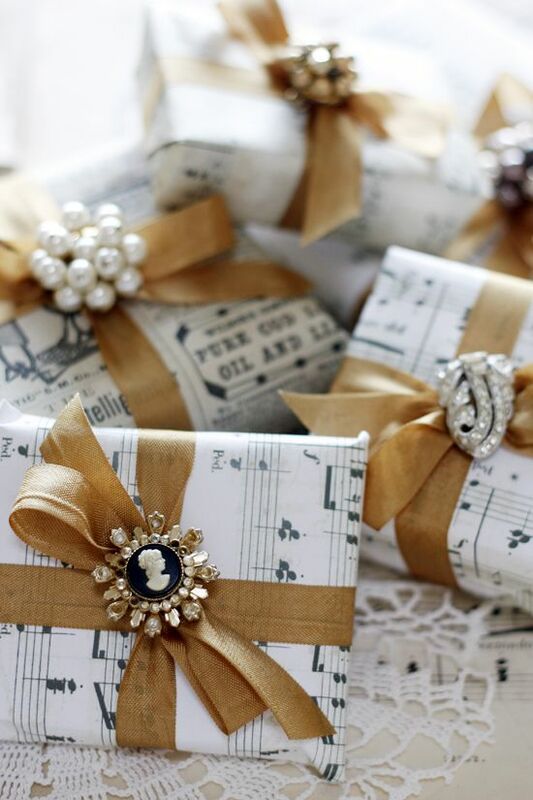 Get ready to think outside the box and wrap your presents in style. 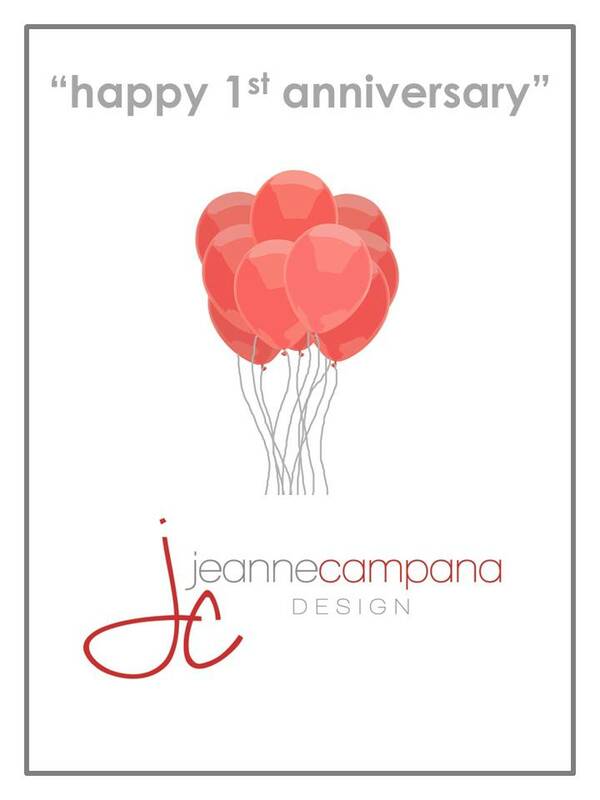 Jeanne Campana Design Turns One! 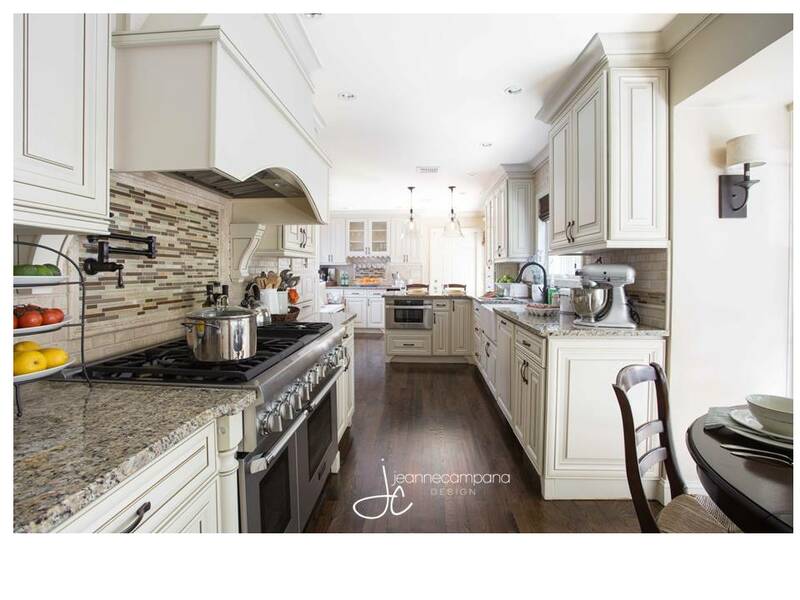 I am thrilled to announce that today marks the one year anniversary of my interior design business, Jeanne Campana Design, and I have to say…what a difference a year makes! Years ago, after graduating from design school and working in New York City on some of the most amazing projects, I decided to leave the world of design after the birth of my first son. It wasn’t an easy decision but one that I thought was best for my family. Being a stay at home mom has it challenges but has also been one of my most rewarding experiences. I have no regrets. Without a doubt, a full time mom is a full time job. 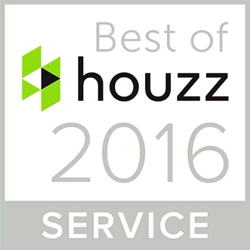 I was lucky enough, throughout the years, to have had the opportunity to design two of my own homes as well as homes for friends and family. It was my creative outlet. I would buy tons of decorating magazines, search the web for ideas and read as much as I can in order to stay up to date on current trends. Having my own business was just a dream and I wasn’t sure if it was ever going to happen. I have thought about starting this business for years, but as a busy mother of three children, it was hard to find the confidence to pull the trigger. How would I ever balance being a mother, take care of my family and run a business all at once? 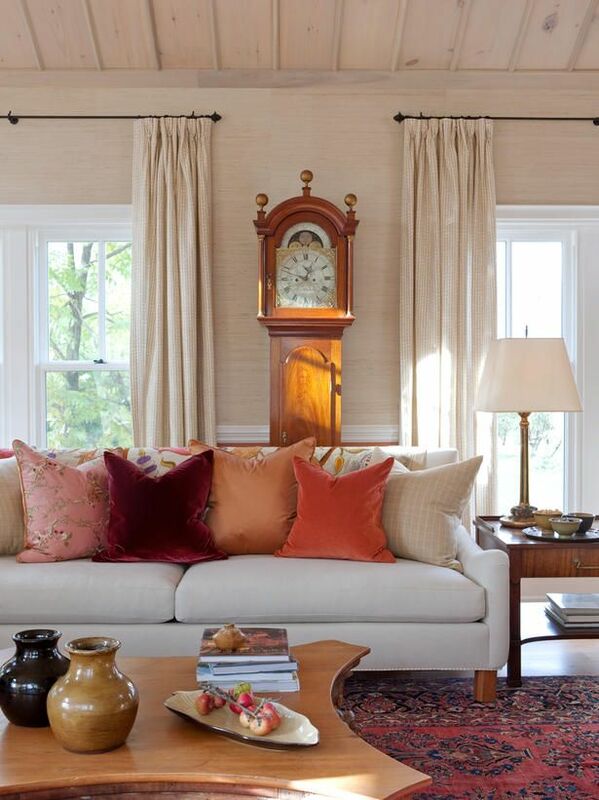 How would I find the time to meet with clients, draw, source furniture and fabrics and still be home on time for the bus, take my kids to their baseball practices, football games and ballet classes? How will I find the time to make dinner? Last year, after taking on a major kitchen remodel in my own home, I realized how much I missed working in the design industry. I loved the whole design process of my kitchen from start to finish. From simple sketches to detailed drawings, material selections and construction management, seeing it all come together was incredibly satisfying. The end result was the kitchen of my dreams and one very happy family. It means the world to me to see my family and friends gather in kitchen and enjoy my accomplishment as much as I do. So with the support of my amazing husband…my biggest cheerleader, who gave me the courage to do what I love, has hugged me when I felt overwhelmed and high fived me whenever a new job opportunity came along…I convinced myself to take the plunge. I showed my kids how to do their own laundry, put their dishes in the sink, and made sure they kept their rooms clean. Sometimes (ok, more than sometimes) they still need daily reminders and a little bit of help (ok, a lot of help) but everyone was on board with my business venture. It hasn’t been easy…early mornings, late nights and a lot of carpooling in between…but it‘s all worth it and here I am one year later. 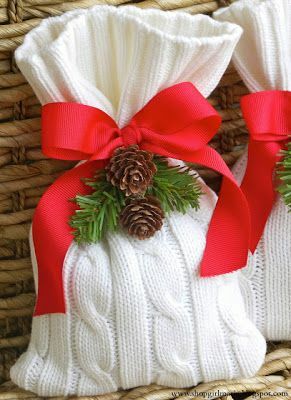 Here at Jeanne Campana Design, I are moving into the final stretch of my current projects that I will be finishing before the end of the year (fingers crossed) and putting together ideas for new projects that will begin in the new year. Some of the projects we have been working on…a spa bathroom, a traditional living room, a living and dining room makeover, a basement remodel, a coastal modern family room and a living room fit for a fashionista. I am also in the midst of designing my very own home office that I am so excited to share with you once it’s complete. There will be lots of photo shoots coming up, as well as the addition of some new services on my website and of course, my blog, “At Home with Jeanne Campana”, which I hope to grow over the next year. The blog has been a place where I can share my current projects and offer designer tips and inspiration. I am so grateful for all of you who stop by and take the time to read it. I’m just getting started so be on the lookout for these new projects over the next few months. I am blessed to have the opportunity to share my love of interior design and so very thankful for the support I have received from my family, friends, colleagues, clients and my blog readers to make my dream of having my own business a reality. Thank you all so much!! Visit my Website for updates on my latest projects and new services, enter your email at the sidebar and follow my blog, like and share my Facebook page and send me your questions and comments. I would love to hear from you. You can also follow me on Instagram for a peek into my daily life as a designer and mom and head over to my Pinterest page, where I am constantly pinning new images on a daily basis, for ideas and inspiration. And if you, or someone you know, is thinking of starting your own business, please share my story. Surround yourself with people who want to see you succeed and take the plunge. I’ll be right there rooting for you. Go ahead, go for it, you got this! I did it and I couldn’t be happier. Cheers everyone! Looking forward to many more years to come. The holiday entertaining season has officially begun. With all the parties and festivities that will be taking place all month long, no gracious guest will want to arrive empty handed. 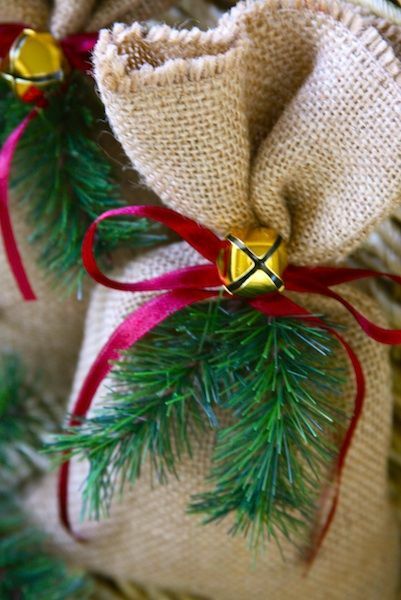 Invitations have been sent, the hostess has cleaned, decorated, cooked, and cleaned again. How can you show your appreciation? 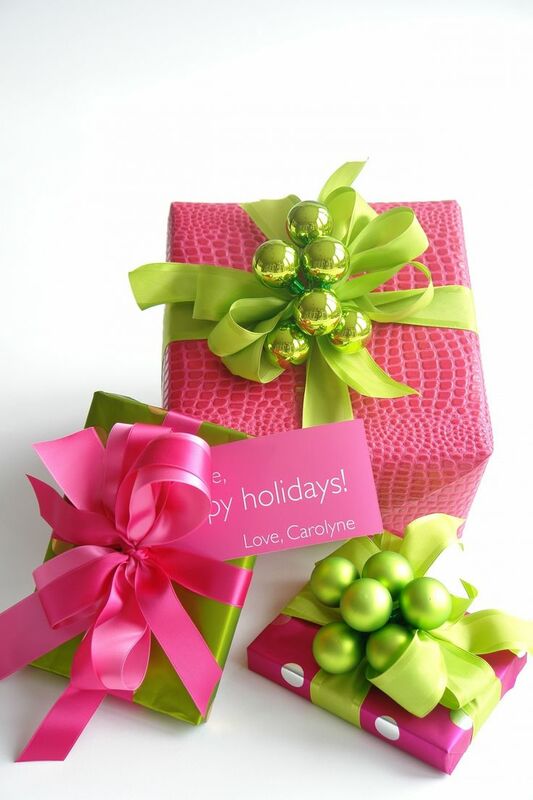 Check out my latest finds in holiday gifts that will delight any hostess. You will be guaranteed to receive a repeat invite next year. 1. 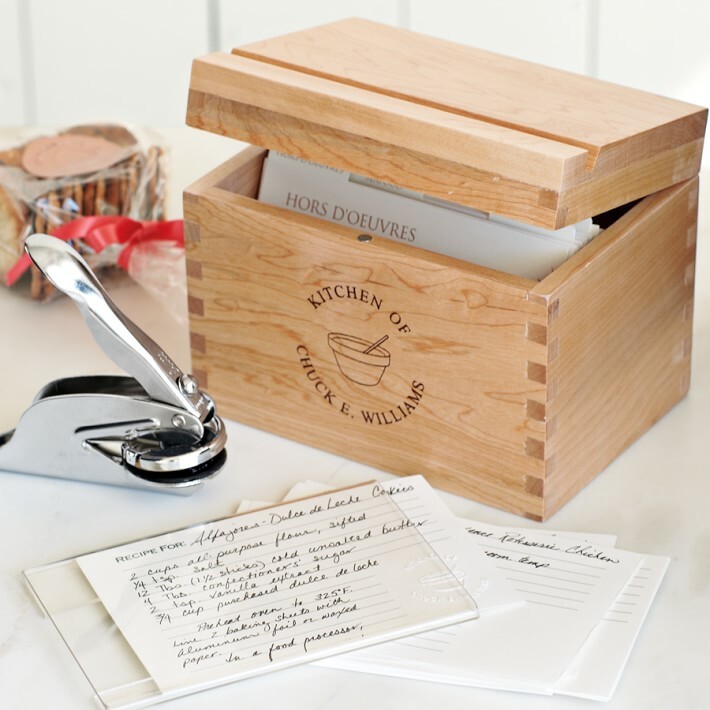 Williams Sonoma Personalized Recipe Box and Embosser. Perfect for sharing and storing all those favorite family recipes. 2. 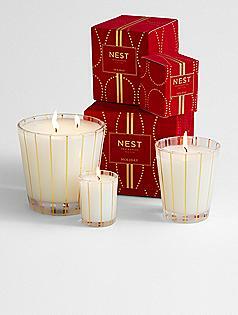 Nest Holiday Candles from Red Envelope. Add ambiance to your hostess’ home and enjoy the fresh scents of the holidays with this sweet smelling candle blended with pomegranate, mandarin orange, pine, cloves, cinnamon and a hint of vanilla. 3. Cheers Around the World Shot Glass Set from Red Envelope. 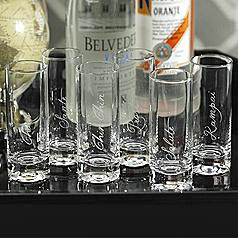 Offer a toast to the holidays with these celebration glasses etched with “cheers” in six different languages. 4. Max’s “All Dark” Chocolate Collection from the internationally known chocolate restaurant, Max Brenner. 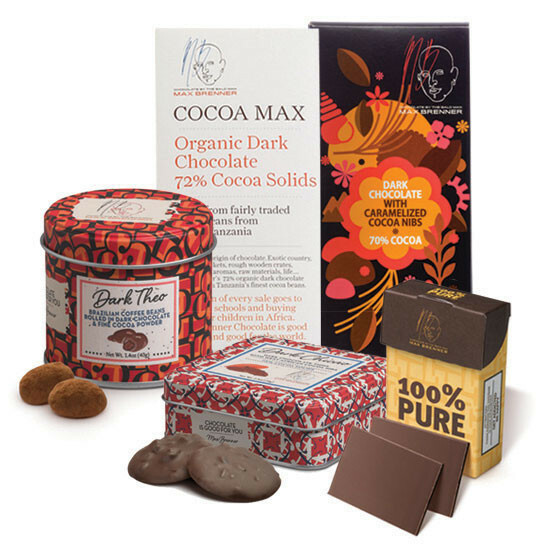 This delicious assortment is sure to satisfy all those sweet tooth cravings. 5. 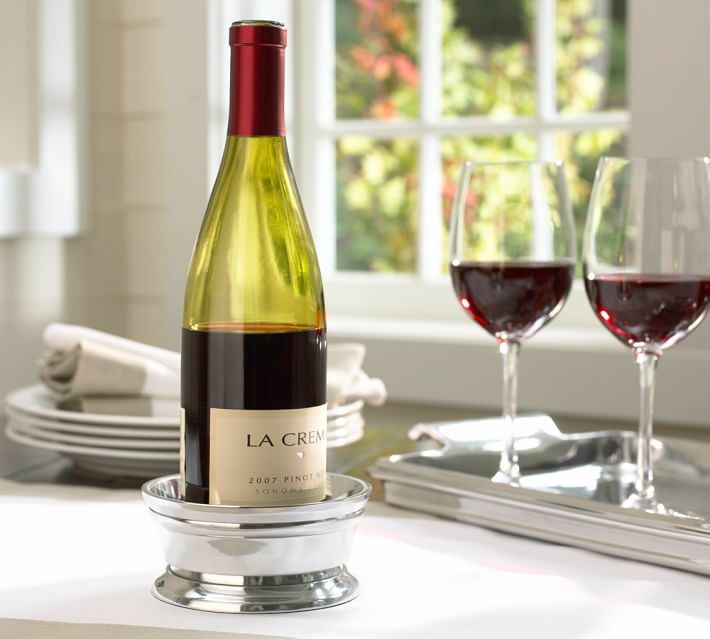 Chancellor Wine Bottle Coaster from Pottery Barn is a beautiful addition to any holiday table. 6. 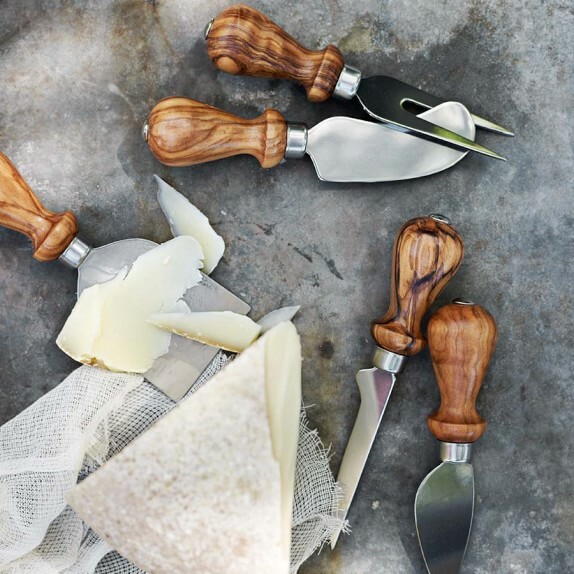 Antonini Olive Wood Cheese Knives Set from Williams Sonoma. A classic gift for the hostess who loves to pair wine with festive cheese plates. 7. 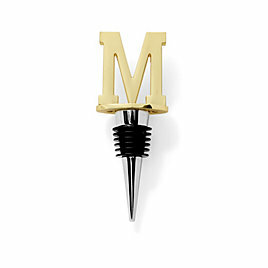 Gold Monogram Wine Stopper from C. Wonder. 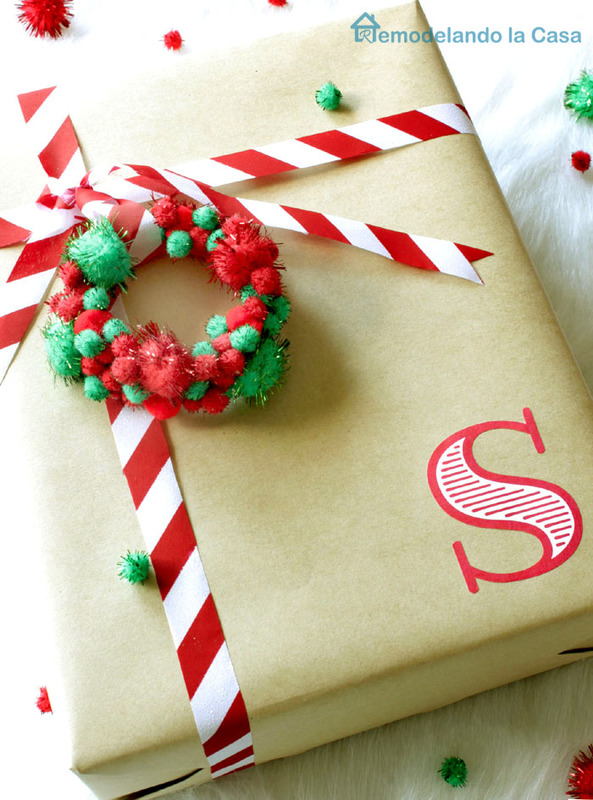 Add a touch of gold to your festivity with this personalized accessory that any wine drinker is sure to love. 8. 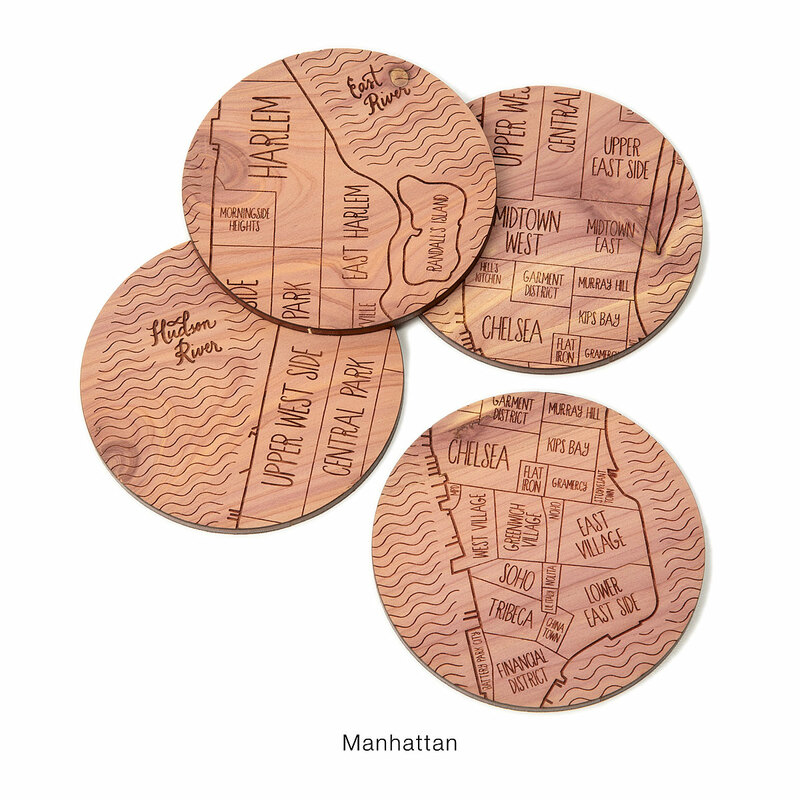 Neighborwoods Map Coasters from Uncommongoods.com. 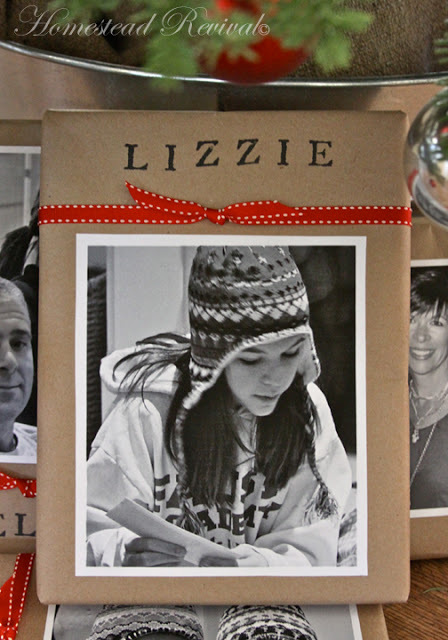 A unique gift idea that celebrates your favorite hometown. 9. I don’t know anyone who doesn’t love watching holiday movies. 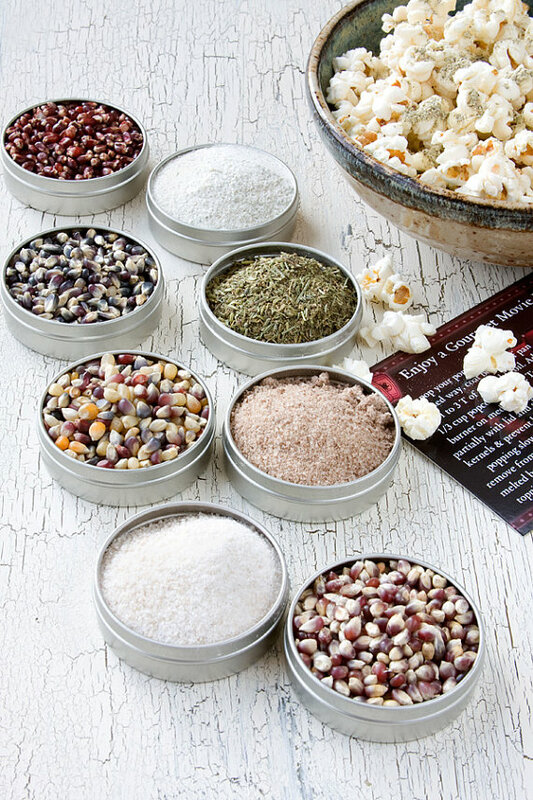 Get in the spirit with this Gourmet Popcorn and Seasoning Mix Gift Set from Dell Cove Spice Company’s Etsy Shop. 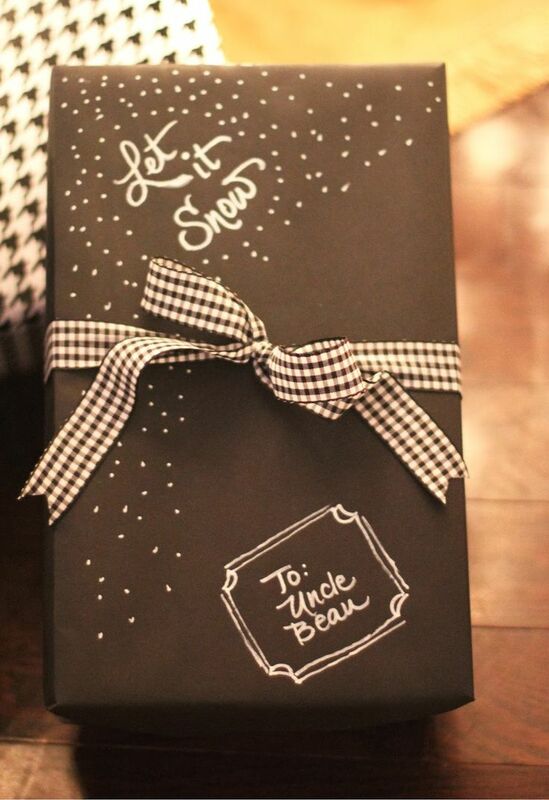 Customized to suit your taste, it the perfect snack for holiday movie nights. 10. 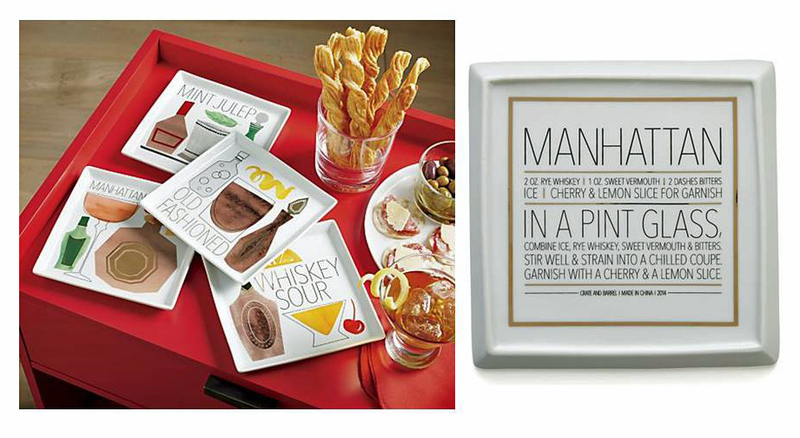 Cocktail Recipe Plates from Crate and Barrel are a great conversation starter and can be used well after the holidays for other occasions and for everyday décor. Flip them over for detailed classic cocktail recipes. 11. 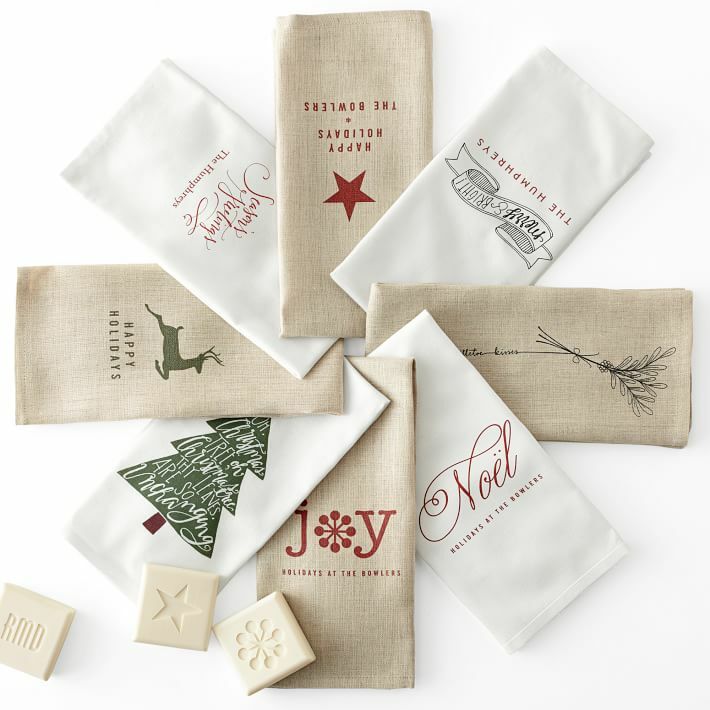 Holiday Linen Guest Towels from Mark and Graham will add a splash of holiday cheer to your kitchen or bathroom. 12. Entertaining can be stressful. 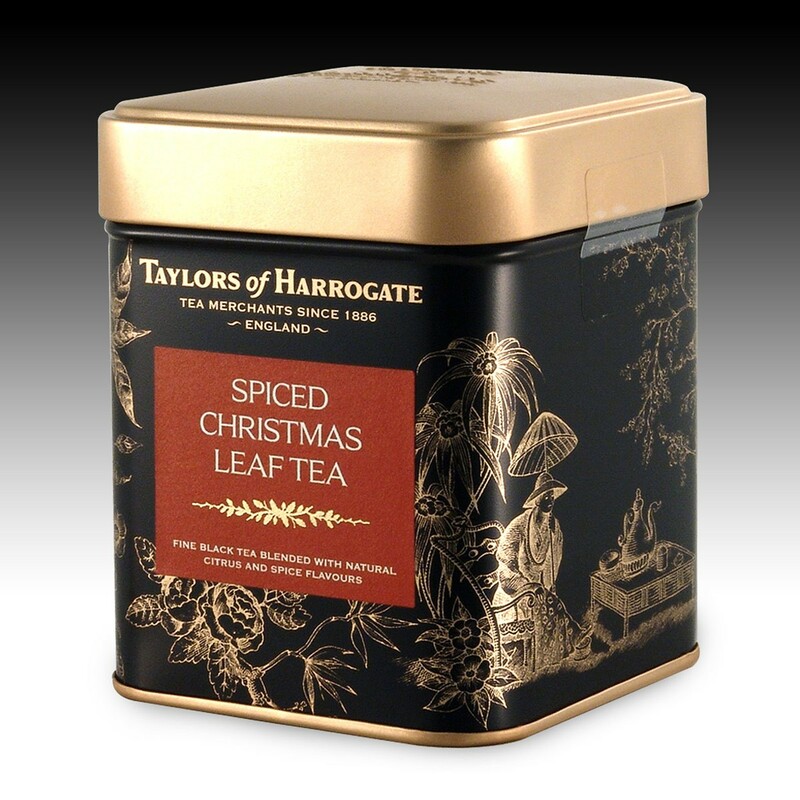 A warm cup of Spiced Christmas Leaf Tea from The English Tea Store is sure to help the happy hostess unwind after a long night. 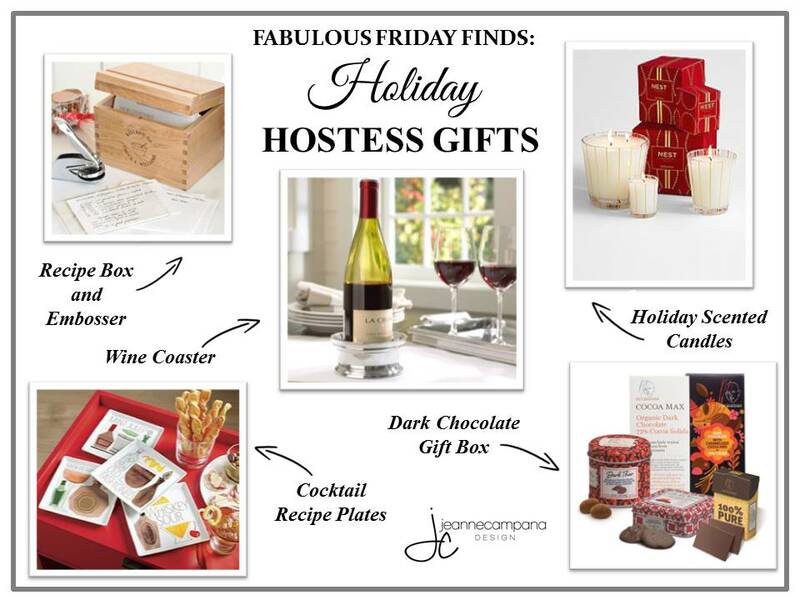 Before your social calendar fills up, enjoy a stress free holiday season by stocking up on a few of these thoughtful hostess gift picks to have on hand during the weeks to come. 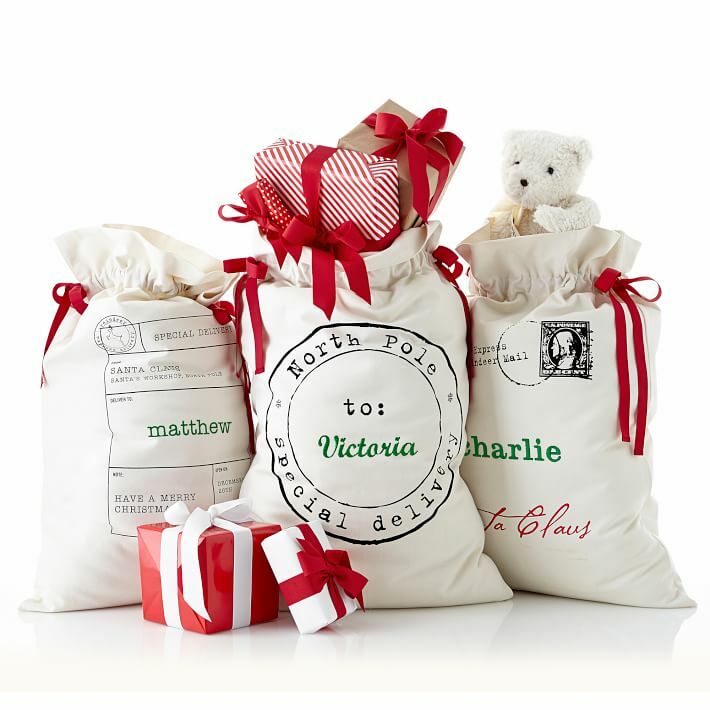 You will be ready for family visits, friendly get-togethers and festive celebrations. 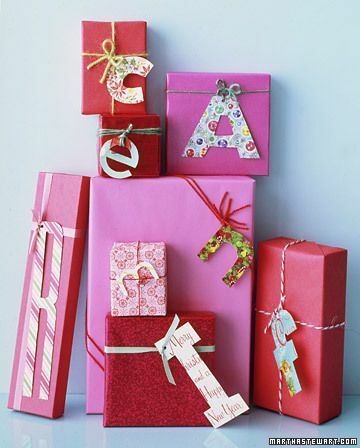 Happy holiday shopping!